Aligned to Common Core and College and Career Readiness Standards, the Essential Skills Workbooks break concepts down into manageable steps to help adult students grasp concepts and solve problems. The lessons use examples from everyday life to make ideas relatable. The three workbooks include lessons in five subject areas. Whether it’s applied to business, science, or personal finance, math becomes more accessible when students can relate it to real-world contexts. Students learn strategies to approach and solve problems, as well as check their answers. All math covered in high school equivalency tests is covered, including abstract problem solving, calculations, algebra, and geometry. 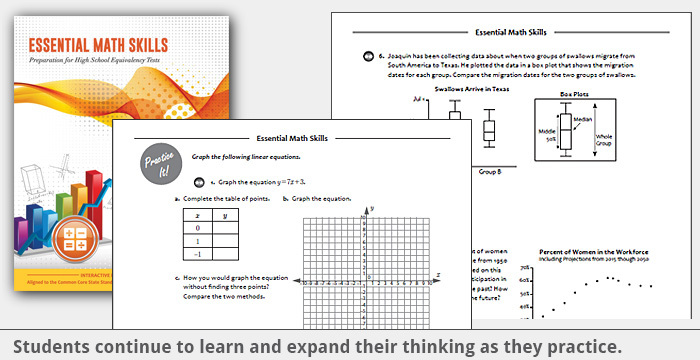 Download a sample of the Essential Math Skills Workbook. In this easy-to-use workbook, students learn to analyze and form opinions about what writers are saying. Through a reading process, students approach the text, determine its purpose, comprehend the meaning, and evaluate what they have read. This workbook develops vocabulary skills, as well as an understanding of central themes, arguments, literary conventions, story structure, and point of view. 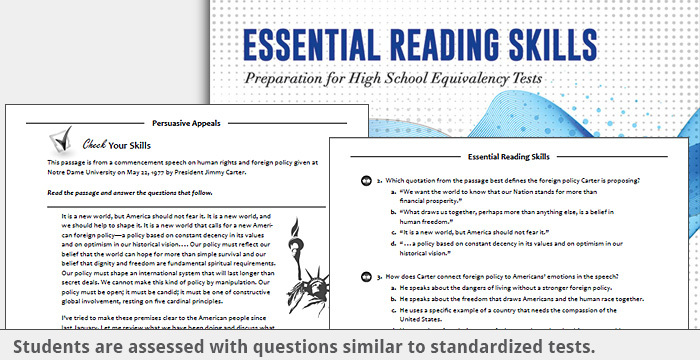 Essential Reading Skills Workbook. Knowing what to say and how to clearly express ideas are core to writing. By practicing effective planning, drafting, and evaluating skills, students can take on any writing challenge. Practice focuses on developing ideas, citing evidence, revising, editing, and proofreading, as well as defining language mechanics. Science and social studies writing practice is also included. 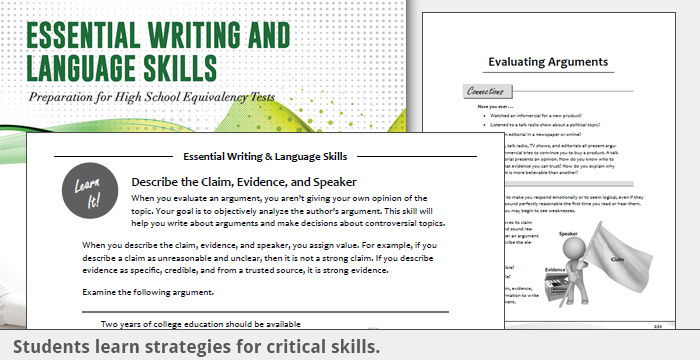 Download a sample of the Essential Writing and Language Skills Workbook. Essential Skills workbooks provide extra practice and review so students can understand and correct their mistakes. Practice test assessment results prescribe workbook lessons, showing students exactly what they need to work on. Students focus on building foundational skills in math, reading, and writing. Science and social studies are integrated into all three workbooks, so students learn how to think about science and social studies within the context of the basic disciplines. With editorial review from nationally recognized educators in the adult education community, these workbooks are designed especially for adult learners. All lessons are aligned to the Common Core Standards and College and Career Readiness Standards. Orders can be placed by calling 1-800-931-8069 directly. Or send us an email to order workbooks. Shipping is available through UPS, USPS, or your preferred fulfillment supplier. We ship from West Coast and East Coast locations to keep shipping costs as low as possible. Choose the number of books to fit your class or school, then enter the exact quantity you want in the box and select "Order"
Choose the number of books to fit your class or school, then enter the exact productQuantity you want in the box and select "Order"